How many Wickhams, Willoughbys or Mr. Collins’ have you met before a Captain Wentworth, Mr. Knightley, or (miracle of miracles) Mr. Darcy landed on your doorstep? For the benefit of those who may not know who those gentlemen are, they are male characters in Jane Austen novels. They teach her heroines important life lessons about romance and love, and if one is paying attention, one can glean more than just the experience of reading a masterpiece of literature. Not only is Jane Austen a brilliant writer, she is a great life coach too. We have long harbored the belief that everything you need to know about life and love is right there among the pages of Austen’s six major works. So does author Elizabeth Kantor. 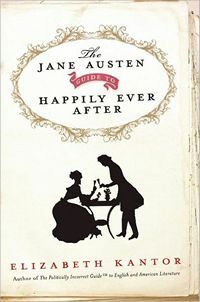 Her new relationship book, The Jane Austen Guide to Happily Ever After, will explain it all in an insightful and entertaining way. Even this grizzled Janeite learned more than a thing or two. The book is broken down into sixteen lively chapters, like: What Do Women Really Want from Jane Austen? ; Don’t be a Tragic Heroine; Jane Austen’s Skeleton Keys to a Man’s Potential; or Arrange Your Own Marriage in the Most Pleasant Manner Possible. There’s even a fifteen page appendix questioning if Jane Austen novels are just entertainment or did she really intended to give us relationship advice – and eighty-four pages of numbered notes citing every source used on every page. Yes, gentle readers. Kantor has researched the heck out of this subject and it shows. Now…off to re-read the important bits, again. Laurel Ann, great review! Sounds like I could have used this when I was 18..and 19…and 20…..and 30…and 40,,, I’ll look forward to reading this! Great review! I pretty much read anything with the words ‘Jane Austen’ in the title, but this sounds like a good read. Thanks for the recommendation. This sounds like a lot of fun and one I could pass on to my daughter. Great review! i really appreciate all of the book reviews on here…am now reading Death Comes to Pemberly by P.D. James which I first heard about here…Thanks! I have already heard about this book and am really looking forward to reading it! I would like to politely disagree on one thing stated above. The comment that all Austen’s heroes teach their heroines how to love, I’m not directly quoting, I had an immediate reaction to that. There is one of her books where her heroine teaches her hero- Mr. Darcy. Yes, she grows during the book in many ways as she reflects that she could have/should have made a different response to several things- the prejudice she didn’t realize she had, etc. I think that she learns things as a result of her interactions with him but I think she taught him more than he taught her by a long way. He takes her corrections during his first proposal to heart and begins to look at things the way she did and sees that he needs to make many alterations to be the gentleman that she said he was not. His whole identity is that of being a gentleman before Lizzy says differently. He had no idea of ever seeing her again but he decided that her criticisms were apt and that he did not want to remain the man that he was but taking to heart and practicing and thinking differently as a gentleman after her. So, I would disagree with all of Austen’s heroines are taught by thei heroes. I think Pride and Prejudice is the exception to that statement. Any responses either pro or con would be interesting for me to read. Karen: You are right about Lizzie and Darcy, but I would add that Darcy teaches Lizzie (by example and not intention) the worth and nobleness of ‘anonymous’ giving. He does this in his vigorous efforts to hunt down Wickham and Lydia in London and his subsequent efforts to conceal his involvement with the settlement (in his dealings with the Gardners). I believe that Jane Austen ‘highly esteemed’ this particular quality; she illustrates it several times in ‘Emma’ through Mr. Knightly’s actions and it is that which stirs Emma’s heart! Elizabeth Kantor has given us some wonderful insights into the mind of Jane Austen! Thank you, Laurel Ann, for this enthusiastic review.